We don’t have a formal policy, but unofficially the etiquette is not to charge for crafting. Although it’s fine to ask for mats, of course. Especially for higher level items– I know I for one just don’t have a huge stash of materials at all levels. I would have thought/said the same until I saw that my current guildies have a different POV. The most expensive pieces of gear on the GTN only cost about what you make from one days worth of daily quests at 50. So most 50’s in my guild just give things away. You can make a huge pile of credits in a few days, why bother to sell things? I’m not a fan of dailies (the repetition gets to be too boring) so I for one prefer to craft items and sell them in the GTN. For me, it’s an easier and more fun way to make a few 100k creds per day. That said, I do often give away crafting schematics and missions and other items I pick up over the course of my adventures– to me, that’s part of building the guild community — giving back. That is sort of dependent on what the item is though. Basic stuff like leveling green earpieces (I am cybertech) I definitely make and not expect or receive a tip… but recently I asked my guildie to farm me a half stack of titanium, and you can bet I’m planning to pay him for it! So I guess that’s a kind of convoluted type of sale. It is kind of weird to see people offering it for outright SALE in guild chat though. This is the sort of scenario I’m also used to. And I love figuring out something fun to send as a thank you! I think that for crafted items you should either provide the materials or at least cover the cost of them. As far as gear, why not give guildies a jump on it before putting it in general or on the GTN? Just gotta keep it in moderation so it doesn’t become obnoxious. Generally people in our guild don’t charge and offer lots of stuff for free to /gchat first. We don’t have a hard and fast rule about it and I think most people will either offer mats or tip or something but everyone’s pretty laid back. I clamped down when there was talk of making a guild co-operative to corner the market on the GTN though. An interesting proposition for sure, but I didn’t want there to be people falling foul of a guild cartel because they posted items for less than the “agreed” price. That’s a good call– I wouldn’t be surprised if creating an economic cartel and price fixing might be considered exploiting the economy, in addition to having the potential for many dramas. I think “selling” is fair only to the extent that it covers the cost of mats. Instead of providing mats, the guildie who wants the item is providing the rough cash equivalent of the mats. Usually this happens if the guildie doesn’t have the mats and they are overpriced that day on the auction house etc etc. My point is, as long as it’s “at cost” it doesn’t matter if the cost is paid in mats or cash-for-mats. But profit? No. In fact I became irate at one of my guildies who wanted me to use my transmute cooldowns (which I was happy to do when it was for that guildie’s benefit) – and then it turned out he was using the transmuted materials to make a profit. Um. No. I’m not going to go to the trouble to make sure I transmute your doodad every cooldown if it’s for your pocketbook. Take a hike. Did we know the same tailor by chance? I really think it depends on the guild. In our small socia/super casual raiding guild in WoW, we had guildies donate greens to our guild enchanter who then would keep a tally of the donations on the forums. The guild enchanter would then dole out guild enchants free to members. Random BOEs would just be given to whoever needed them (as long as you were going to use it, not sell it) and because we were all good friends, most crafting worked in much the same way: you’d craft whatever using your mats because you knew very well that whoever you were doing that for would help you out later. Big guilds don’t have the same luxury, however, and in the bigger raiding guilds I was in it made perfect sense to me that people would ask you to supply the materials if you were crafting something, or offer to sell a BOE for (I’d hope) a discounted price. I often bought discounted rare crafting materials through my larger guilds, and never questioned it. Straight up charging a guildie for crafting an item as a fee on top of demanding materials though seems like it would breed ill will or resentment. That’s really the only time I could see it causing problems in a larger guild. 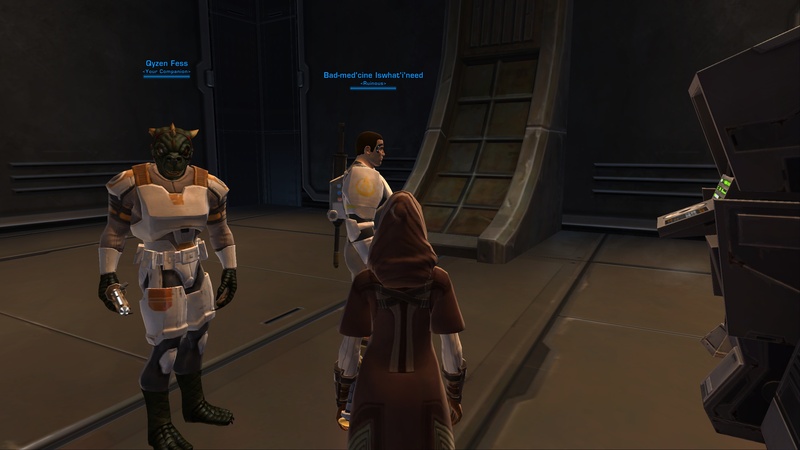 It will be interesting to see how the crafting economy in SWTOR evolves once we have guild banks. I think that will encourage more pooling of resources. I don’t think I’ve ever been in a guild where members have actively charged for items to be crafted. If I ever need something made and a gulidie is available to do it I’ll always A) bring the mats and B) tip. I know a tip isn’t needed, but I’m of the opinion that it’s cost the crafter to level their profession in time and money so they deserve to get something in return. Plus it’s nice to be nice! I have many a fond WoW memory of sneaking a tip into the trade window then having a standoff w/my guildie crafter over accepting or not hehe. I don’t think you’re obligated to GIVE guildmates things. Many people choose to be nice to their guildmates and give things like enchants for free but I’d never expect it, I’d always provide mats. I do think you are absolutely obligated to craft for free. Consumables should only be made for AH mats value. Crafting / cutting / etc should always be done for free. I’d be stunned if someone tried to charge. But I’ve only played in tight knit guilds. Make money off the AH– not off your buddies. And I further agree that Gchat should not be a place for you to profit from your guildies– take that action to the auction house! In terms of crafting I’ve seen most of my guildies be fairly giving. When it comes to drops though, they’re all about selling. Granted, the guild member discounts have been pretty significant (like selling modifiable bracers/belts for 20k when they sell on the GTN for 100-150k minimum), but I have seen significantly more selling within SWTOR guilds than I ever have before in other games. If I’m looking to make credits, then I put it on the GTN or bark it in the fleet. When I’m looking to help out the guild members, it goes to the first person to respond to my offering or the one who can make the most use out of it. I don’t charge guildies anything and I don’t like them insisting to do pay me either. It is interesting that you are also seeing the same tilt towards inclinations to sell items in SWTOR G that I have also seen. It takes some getting used to! Pingback: TOR Reporter Episode 18 – Frogs wear pants? My guild never has had, and probably will never have a policy on this. The atmosphere and rule seems to have developed that if you offer an item or service in chat, you’re giving or doing it free. This is not the standard rule across the guild, as THUNDER is multigame, but is the SWTOR rule. I think it developed quite by accident from the fact that for the first two or so weeks there was no economy in which to sell anything – so it might well be given away. many guildmembers, myself included, still make the point of offering the guild first dibs on anything we then decide to sell to the wider public.